From doing a bit of research there isn’t really any difference between recipes for orzotto and risotto other than the change of main ingredient. The main difference is that barley takes longer to cook. What follows isn’t really a recipe, it’s a baseline, throw in what you have to hand and what you love the most. I love adding chicken, bacon, mushrooms, bell peppers and peas. 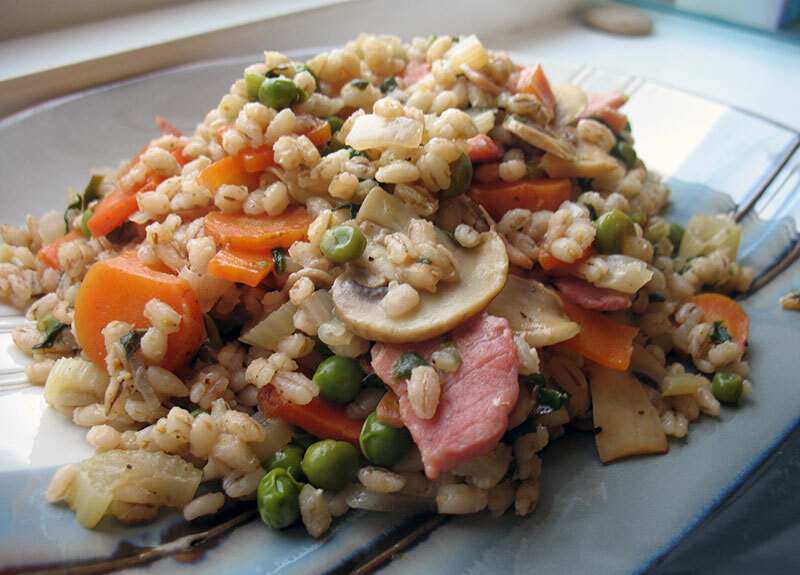 A basic recipe for a Orzotto – a pearl barley risotto – change to use what meats and vegetables you have to hand. 100ml of white wine, I actually used a zinfandel I had left lying around from a dinner party. Because the pearl barley takes so long to cook, and I was in a rush, I cooked the ingredients slightly out of order to give the barley the longest possible amount of time. Normally you would cook up all the ingredients till they are mostly cooked then add the barley and stock, leaving to simmer for around 50 minutes. Feel free to use this method if you have the extra time, as it would probably make the resulting dish more flavourful. Add the onions, celery and carrots into a large pan under a medium heat with a lid (I used a Cast Iron Le Creuset Casserole dish), and a little bit of oil. Cook for a couple of minutes then add the pearl barley, and cook for another 2 minutes. Stirring occasionally so it doesn’t stick. Now add the white wine, and stir quickly to losen any vegetables or barley stuck to the bottom. Once the wine has evaporated, pour in your stock. This is a departure from the normal way to cook risotto rice, but in fact makes it easier on us, less stirring, less keeping an eye on the pot. Add the lid and leave to simmer. To check it’s ready I use the very technical method of just eating a bit of the barley, if it is still a bit crunchy then I replace the lid adding a bit more water if necessary and try again in another 5 minutes. If not it’s ready. If when your barley is ready it’s still a bit liquidy then remove the lid and give it a couple of minutes to evaporate the extra water. Serve with black pepper, and if you fancy a grating of parmesan cheese. I was worried that the barley might give a strong flavour to the dish, but it didn’t, the flavour was just the same as if i had used the same recipe for a risotto. We both loved the change of using pearl barley, and I will definitely be using pearl barley as a substitute to rice in more dishes. (I spotted this great looking spring barley dish over at the guardian this morning, that sounds worth a try).